AGEbeautiful's two new collections, Neutral Violets and Red Violets, add a cool violet vibe to brown and red tones. 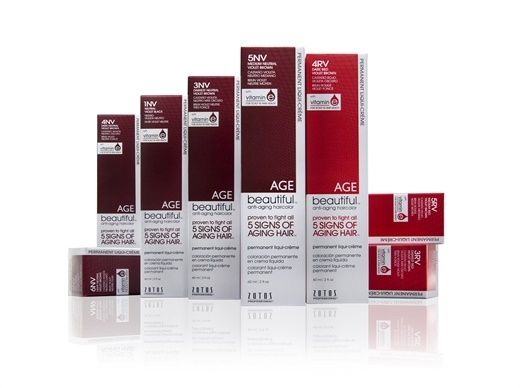 AGEbeautiful 5RV + 20 vol. Process for 35 minutes. The Neutral Violets deliver an understated brunette infused with just a hint of violet to add sparkle and shine. They’re ideal for brunettes who are ready to turn down the heat and add a cool, crisp kiss of violet. The Red Violets mix the heat of vibrant reds with the cool of rich violet undertones, for the perfect blend of two AGEbeautiful fan favorites. Both collections offer powerful 100% gray coverage, plus the signature AGEbeautiful promise to protect against all 5 signs of aging hair for beautifully youthful-looking strands.